A corn disease new to the U.S. has been found in Indiana. 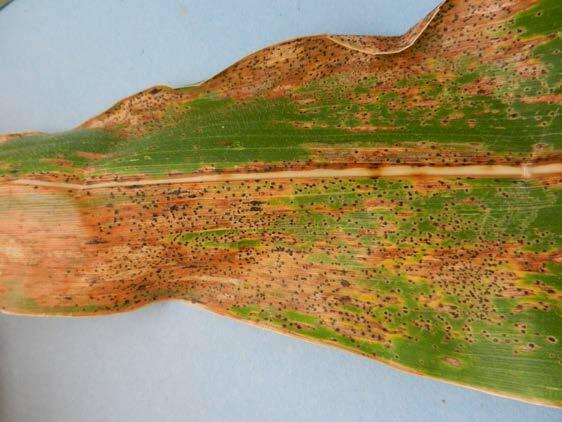 The disease is known as tar spot which is a good descriptor of the small black fungal bodies found on the surface of infected corn leaves. Please see the full article from Purdue University for more detailed information including multiple, excellent photographs. We are encouraging all to be vigilant for symptoms that that look like tar spot in New York corn (field, sweet, popcorn) fields over the next few weeks. It will be essential to follow this up with laboratory diagnosis and official identification by USDA fungus experts. Please contact Gary Bergstrom (gcb3@cornell.edu), Jaime Cummings (jc2246@cornell.edu), or Karen Snover-Clift (kls13@cornell.edu) if you find suspicious symptoms and to arrange for sending a sample to Cornell for diagnosis. There will not be a charge for this diagnosis.